Terry Butcher believes Hibernian have paid the price for failing to replace striker Leigh Griffiths, after they were left facing a relegation play-off. 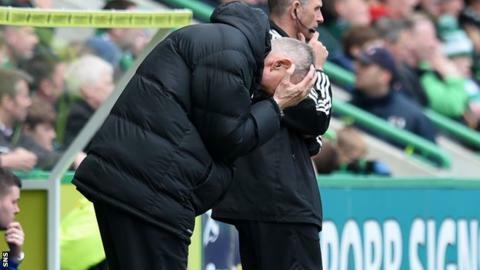 A 1-0 defeat by Kilmarnock sealed Hibs' Premiership play-off fate, and manager Butcher lamented his side's inability to put the ball in the net. Griffiths hit 28 goals while on loan at Easter Road last season. "We're missing a striker like Leigh Griffiths, a top class man to put the ball in the net," said the boss. Butcher's predecessor Pat Fenlon signed James Collins for £200,000 in the summer, but the striker has scored just six goals this season. The Easter Road side enjoyed long spells of possession against Killie, but the closest they came was when Liam Craig hit the bar with a shot. "It's been the story of our season in the last 10 or 12 games in particular, where we've done everything but score in the match," added Butcher. "We were well on top in the first half, and they get one opportunity and it's in the back of the net. Unfortunately it's fallen to Kris Boyd and he doesn't normally miss those chances. "We dominated the first half with good possession and put a lot of balls in the box, and it just would not break for us. Second half we didn't have as much possession and Kilmarnock looked comfortable. Then we got to grips with it again and we've hit the bar and had loads of incidents in front of goal, and it never dropped our way. "Fair play to Kilmarnock, they've come and won 1-0. They did not have many chances in the game, I know [goalkeeper] Ben Williams made a good save at the end, but he's hardly had anything to do." Hibs will now face one of the top sides from the Championship over two legs, with the first taking place on 21 May. "We have to keep going, we're not relegated, we've got two games left that can ensure we stay in the Premiership," said Butcher. "The last four games the players have been totally committed, and they've played very well. They played well again today but once again it's Hibernian nil. "It's soul-destroying, it's disappointing, it's heartbreaking, we're all devastated because of where we've finished and we just haven't put enough goals in the back of the net. "We've got 10 days now until the first play-off match and we'll work on it, we'll work very hard. "It's hard to look forward to these games because it feels like you've been slapped in the face, and I can only say sorry to the Hibs fans because we've put them through the wringer, and we're put through the wringer on the sidelines as well because it just would not go in." Fans vented their anger outside Easter Road at full-time, with chairman Rod Petrie in the firing line. And despite the frustration of the supporters, Butcher insisted he is still fully focussed on the job at hand. "I'm absolutely committed," he added. "The fans were great today, they really got behind the team. "They tried like the rest of the boys tried, it was a great effort from the players but it just isn't happening for us in front of goal and we're punished at the other end. It's the usual story but it can't be the usual story in these next two games."